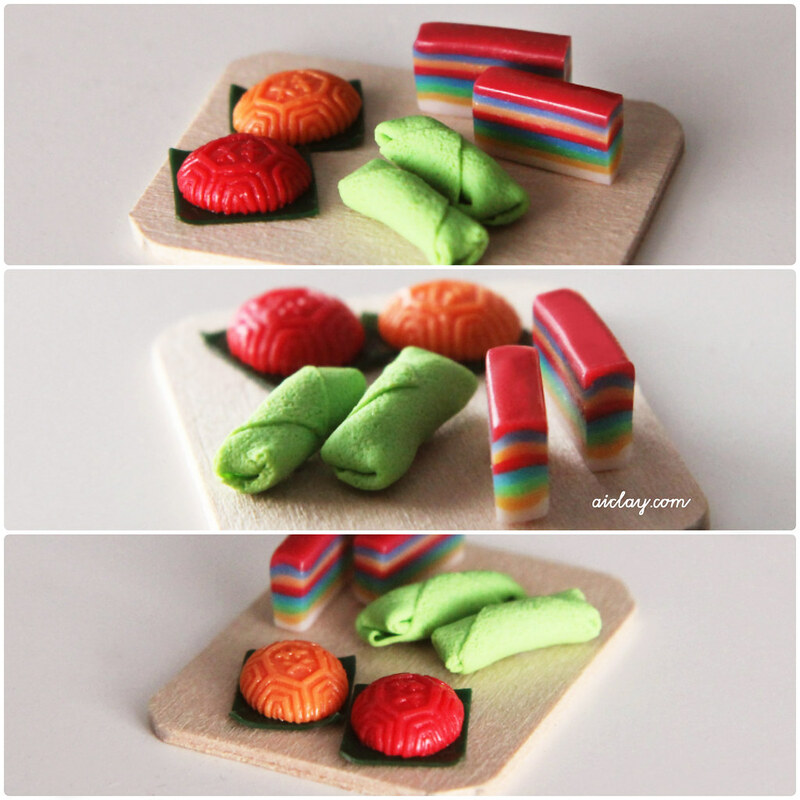 Miniature nyonya kueh, hand sculpted by me with polymer clay. If you've ever been to Southeast Asia (or specifically Singapore/Malaysia), you would have seen these pretty pastries in most traditional bakeries. They are either filled with a salty or sweet paste, with a mochi-like consistency on the outside. I guess these are our local equivalent to the beautiful western petit desserts. For ages, I've been wanting to make some local food, and finally I have. YES, one strike off my to-do-list. So firstly I got started on the miniature angku kueh. 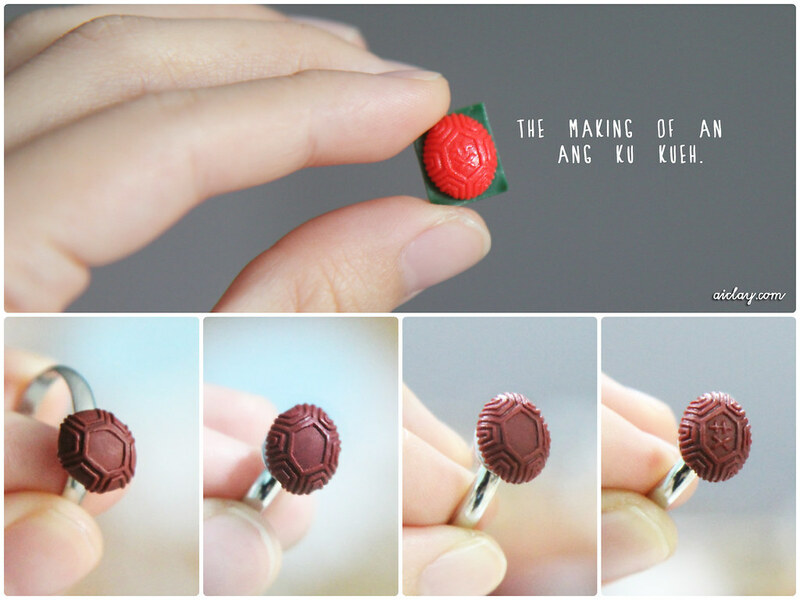 It usually comes in the shape and intricate pattern of a tortoise shell (the ku in angku stands for tortoise), which I recreated in the tiny scale. I have this strange passion for making master forms, maybe because I know I just have to create ONE piece and I can while away hours just perfecting it. And then it'll be made into a mould so that I can create many tiny angku kuehs. When I posted up these photos on my Facebook page, I wrote about my weird habit of peeling the lapis sagu (the stack of colourful layers) apart and rolling them up before chewing on each piece. And surprise surprise, it turned out that many other people shared this habit too haha. Ah, so I'm not alone. While I'm planning my schedule for the last 2 months in 2013, 2014 is very quickly creeping up on us! It's a bit scary how time passes so quickly, but then again I'll rather feel that way then wait around idling and wishing for the days to go by faster. You know what I mean? Ever since I've been working for myself, I've been going through various emotional phases. There was a period when I couldn't settle down to work, and I struggled with self-discipline and often weeks and months went by with nothing happening on the AiClay front. And then there came self-doubt, where I questioned myself everyday about the decisions I had made, the lifestyle I was in. Monetary worries plagued me constantly, and yet I was still avoiding the reality checks by giving myself lame excuses. Procrastination became my middle name. I didn't know what I wanted, I only knew what I didn't want (which was to return to working for someone else). It felt like a faint line between plain laziness and ambition. In 2013, things started looking up (oh PHEW). I discovered I could teach workshops, and that I actually enjoyed teaching. Starting AiClay's miniature food workshops was undeniably the turning point for AiClay, and it gave me a renewed sense of purpose. Honestly, you know I was very much against teaching my craft at the beginning. 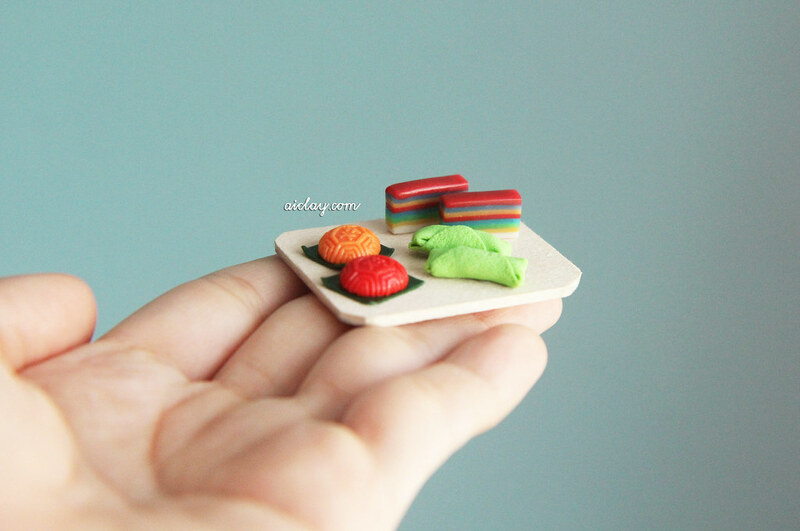 It felt like I was giving up my original intention to be a crafter, and that silly selfish voice in me questioned if I should be teaching potential competitors in this tiny market of miniature food crafters. But silly silly me, I was letting myself getting the better of me as it turned out. I've always been brilliant at imposing invisible boundaries for myself, and the only barrier I had was my mindset. With every workshop I held, I learned from the participants everyday. Somewhere along the many years of working on food miniatures and fulfilling commissions, I had left behind the joy of creating. When I saw the happy faces of the participants at the end of the workshop, I thought to myself, "Ah, how long has it been that I felt that way?" Sometimes, participants would raise ideas which I had never thought of. When you work at something for so long, you just slip into a gradually repetitive process. It gets comfortable, too comfortable after a while that you no longer question how you could be better. To settle in your comfort zone for far too long, is perhaps the scariest thing to happen to a business owner. So, teaching has brought me not just a very much needed income stream, but also allowed me many opportunities to rediscover, be it in crafting or business. Thank you, if you have ever been to my workshops. I forgot what my original intention of the heart-to-heart was for, but I'm going to end here. No matter who you are, never allow yourself to think you are already at your prime. It's easier said than done, but let's just start by asking ourselves a question, "how can it be better?". What is it made of, the one that you in real life roll up the layers, before eating? Is it like a rubbery gel? The colors you made them- they are really nice!